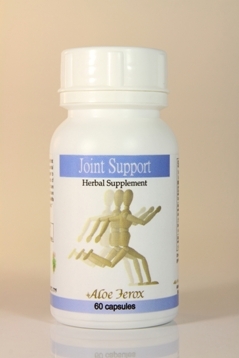 Aloe Ferox Joint support is a herbal supplement specially formulated to help support joint movement. Provides essential nutrients Glucosamine, Manganese and Copper to maintain normal cartilage function. Aloe Ferox Joint Support for arthritis and aching joints. Customer testimonial. ‘I was getting sharp pains around the hip joint and since taking the Aloe Ferox Joint Support it eased considerably and more importantly when I stopped taking it the pain has returned so I would definitely recommend Aloe Ferox Joint Support from Natural Beauty Care which contains Aloe Ferox.’ P Newland, Surrey, England. 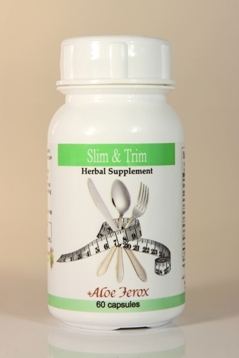 How Aloe Ferox Joint Support can support you. Glucosamine – a critical building block for the production of cartilage and prevents its further destruction. Devil’s Claw – fights inflammation and pain as well as improves joint mobility and function. Copper – essential for the production of collagen thus preventing bone deformation. Manganese – helps to prevent joint damage and inflammation. Directions for using Aloe Ferox Joint Support. Take 2 capsules daily with meals. For best results with herbal products, you should use for at least three months consecutively. Active ingredients. Devil’s Claw, Glucosamine Sulphate, Copper, Manganese. Supplement facts. 1 capsule. Copper 1mg 55% RDA, Manganese 1.5 mg 75% RDA, Aloe ferox bitters 5 mg (as aloe ferox bitter powder), Devil’s Claw 250 mg (as harpagophytum procumbens), Glucosamine SO4 500 mg. Other ingredients: Magnesium stearate, bovine glycerin, tapioca. Aloe Ferox Whole-leaf Aloe Juice is a natural plant tonic which, thanks to its active Aloe Ferox ingredient, has an anti-inflammatory and acid-reducing effect on the body. It is also packed with plant medicinal agents (over 130 in fact) that help to improve vitality and maintain vigour. Gentle exercise such as walking, swimming, yoga and pilates can help maintain mobility and reduces pain and joint stiffness. (a)These statements have not been evaluated by the Food and Drug Administration. This product is not intended to diagnose, treat, cure or prevent any disease. Always seek medical advice from your GP or health practitioner. Health warning: Not to be used with blood thinning medication due to the anti-coagulant nature of Devil’s Claw. There are no known contra-indications for Aloe Ferox. Home.